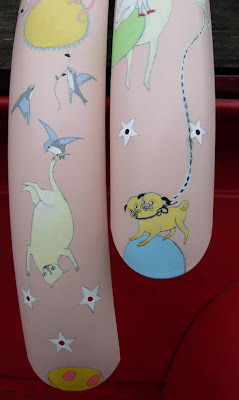 I just might need to own a one-of-kind custom painted Jennifer Davis Bicycle. I am completly in chicken-with-it's-head-cut-off mode finishing up the final details for the Fine Fendered Friends Show Friday night. I can't even begin to express to you how amazing all the fenders are. I'll post lots of pictures on my Flickr account next week after the opening is over and I sleep for like, 20 hours straight. Very nice. Now I want a customized fender for my bike. I've been watching you on flickr for a while and I love you illustrative style! I also adore your fender art. I have a elektra cruiser and you've inspired me to pimp my bike. What would you recommend for painting the fenders? What should I seal them with so that they don't chip/ scratch?